The amount of attention that physician recruitment receives from government eyes warrants recruitment agreements that are, ideally, airtight. So, what are key criteria for a physician recruitment agreement that is compliant and will work for both parties? There are many important elements of a good physician recruitment agreement, including the following. First, it is vital to show that a community need exists for the doctor’s services. A specific need for the physician’s specialty area or an opportunity to lower costs and improve access to care in that community, demonstrated with proper evidence (such as statistical or demographic studies), can lend strong support a physician recruitment agreement. It is a good idea to hire a third party to analyze supply and demand for specialties in the local community. Additionally, the recruitment agreement itself should spell out the need and demonstrate that an objective of the agreement and relationship is to serve community interests. A hospital can provide subsidies to the physician for working in the local area such as reduced rent, a traditional net income guaranty, and payment of malpractice insurance premiums. No matter what type of benefits the hospital provides, however, the physician should sign a promissory note that requires repayment of all subsidies from the hospital. Generally speaking, this repayment obligation can only be waived if the physician remains in the local area for a period of two to three years after the end of the guaranty period. The waiver is to ensure the community’s need for that physician is effectively met through the recruitment agreement. Any guaranty payments made to a group that employs the physician rather than to the physician directly should be with caution in light of the STARK Law, to avoid perceived abuse. Any portion of the guaranty payment made to the physician’s group that is not returned to the recruited physician must be accounted for. The physician group can only retain portions of the payment that directly go to additional expense that attends addition of the new physician. No portion of the guaranty payment can be withheld to pay for existing overhead costs that the medical group already incurs. For example, the medical group employing the physician cannot charge its rent costs to the new physician when he or she did not cause any increase to the expense. Both the hospital and practice should keep careful records that show what formulas are used to calculate the payment amount in order to prevent the use of expenses for preexisting medical group expenses. Any formulas used for calculating the payments to the physician should be very specific. 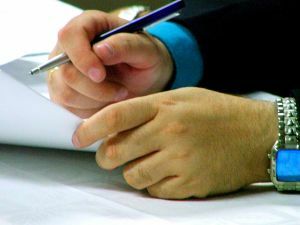 Avoiding vague language in the agreement will reduce the likelihood of disputes. The agreement should specifically state the salary, what expenses are included in the guaranty, and whether the collections of the recruited physician will be reconciled monthly or quarterly. Taking proper care of these specifics will reduce the chance of disputes and unnecessary headaches in calculating payments. The physician must be obligated to repay the guaranty. If the payments are made to the physician group that hired the recruited physician as mentioned above, then the group is obligated to sign the written agreement as well. The hospital should also consider having the physician group guaranty the payment even if it directly pays the physician. This will help ensure that the group does not indirectly benefit if the recruited doctor leaves after practicing with the group. While physician recruitment agreements are under constant scrutiny, the above elements and other best practices help ensure compliance and happy business relationships. The Law Offices of Kevin S. Little PC advises and represents physicians and other healthcare providers, professionals and businesses. We focus on business and healthcare law. Kevin Little is a 22-year attorney rated “AV” rating by Martindale Hubbell with offices in Atlanta and Augusta, Georgia. Contact us at (404) 685-1662 (Atlanta) or (706) 722-7886 to schedule a confidential consultation.